We received a call from a real estate agency that was opening a new office in Encino, California. They were looking for a custom logo sign for their reception area. As you can see from the photos, they wanted a high-end look with metallic letters. 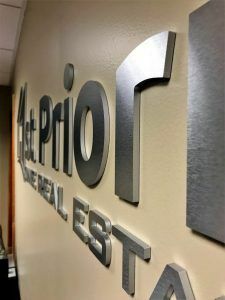 When 1st Priority One Realty first contacted us, they had a different iteration of the logo that was eventually made into the sign. The font was a little different and the logo was black and gold. Initially, they were considering doing gold dimensional letters. There was a little pause in the sign project due to a location change for the new office and when they decided to pick the project back up, they provided us with a new logo file. The font in the new logo was more refined, and they had mocked up how the letters would look in metallic silver. They decided that silver would look nicer with the new office space. Once they were moved in, they were able to get measurements of the wall and we were able to start designing the sign. These may look like metal letters but they are actually acrylic letters with brushed aluminum laminate faces. Instead of routing the letters from actual metal, we can put a metal laminate on acrylic to provide a metal look and we have many different finishes to choose from. One issue with using metal laminate faces on acrylic is that from the side, you can still see the color of acrylic that was used. Our metallic silver and metallic gold acrylic have smokey gray sides also. Some may not mind this if the sign is not going to be seen up close, but 1st Priority One Realty wanted a high-end looking sign so we painted the sides of the acrylic silver. As you can see from the photos, the transition from paint to metal is seamless, and the sign looks great from all angles.